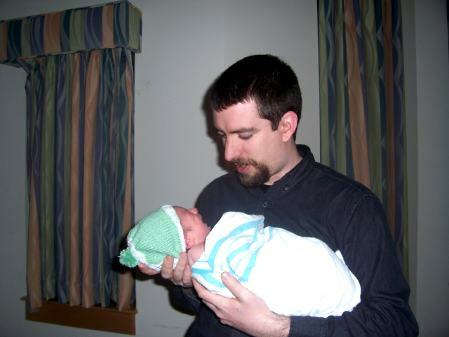 So on the morning of December 5, 2007 Allen and I packed up all our gear and headed to the hospital in the hopes of finally meeting our little boy. 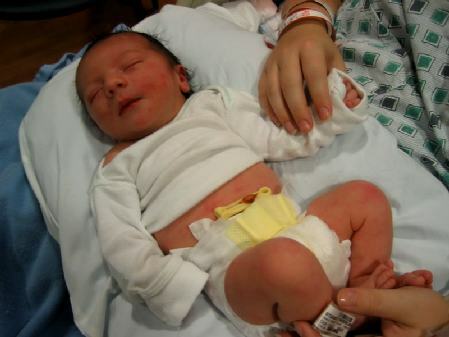 He continued to be stubborn and was needing a little push out the door so we had an induction scheduled for that day. We woke up to find a light snow falling and a dusting on the ground. It was actually quite pretty. I ended up running into a coworker who was supposed to have been induced on the fourth, but had been asked to come back because the labor center was too full. I was quite glad to hear that things were on schedule for our induction. I was admitted and by 8:30 was started on an IV pitocin drip. The next four hours were pretty boring. Not much happened and I did not experience a whole lot of discomfort. I read a book while Allen played his DS. At 12:30 my doctor came in and broke my water. My discomfort went from 0-100 in a matter of minutes. Unfortunately I was number 6 on the wait list for an epidural. I am pretty sure that was the longest hour of my life:) Allen too really good care of me and I survived. After the epidural my labor apparently went into overdrive. After about an hour, I was pretty sure the epidural had worn off, but it turned out that baby was ready to make his way into the world. Despite my best efforts he was still lost and refusing to ask for directions two hours later so off we went to the OR for a c-section. Surgery went smoothly and at 7:06 pm on December 5 Nathaniel Mark made his way screaming into the world. 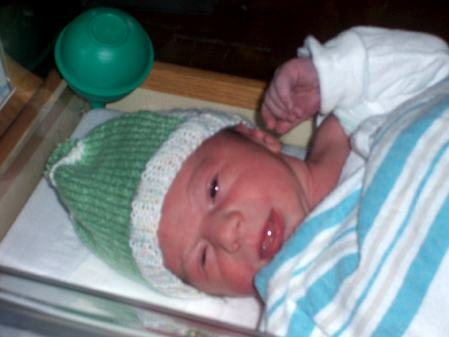 Nathaniel weighed 7 pounds 15.8 ounces (I am still not sure why they couldn’t round) and was just under 20 inches long. He has beautiful dark gray eyes and a head full of dark hair. He is absolutely beautiful and we have all fallen madly in love with him. Nathaniel has also been a really good baby so far. The only frustration is that he started to refuse breast feeding the last day we were in the hospital. It has been frustrating, but we will be meeting with a lactation consultant tomorrow to try and work things out. So now we are all home. My mom has come down a couple of times to give Allen and I nap breaks which has been wonderful, but things in general have gone smoothly. Right now we are all hanging out together in the basement…me surfing the web, Allen working on his homework and Nathaniel, Cooper and Zoe all snoozing peacefully. It is quite nice. I am also glad to say that the kittens have not gotten their noses too out of joint over the new arrival. Cooper has spent a fair amount of time trying to sniff Nathaniel and Zoe has actually become a bit bolder with all the guests in the house. The biggest issue is that they are not allowed in the bedroom with us at night until my incision is healed a bit more and we feel more comfortable with Nathaniel being in another room with the door shut. And no for some adorable pictures. Some lovely person hand knit this cute hat for the hospital and Nathaniel became the proud owner. It has an adorable puff ball on top. Huge congratulations to you both, he’s beautiful! ongrats on your little baby. He is beautiful! Congratulations to you and your husband! What a beautiful boy!! Congratulations to you all! Oh Leslie, he’s beautiful! Well done and congratulations to you all! Oh Leslie… Your boy is so beautiful… Welcome to the world Nathaniel! Thank you SO much for sharing those pictures. Big congratulations to all of you! Congratulations Mommy and Daddy!!! I am so excited for you. I’m sorry you ended up having a C-section. Take it easy and relax. He’s beautiful and perfect, Leslie! I hope that you’re able to rest and heal. Don’t worry, nursing is tough at first, but give it time, and before you know it , it’s second nature. Congratulations! I’m so happy to hear Nathaniel is here and you are both doing so well. He is of course gorgeous!! Congratulations on that beautiful, beautiful little boy! Beauiful! I know he is so precious to you all! Congratulations! Congratulations!! He’s such a cutie. Enjoy getting to know him! 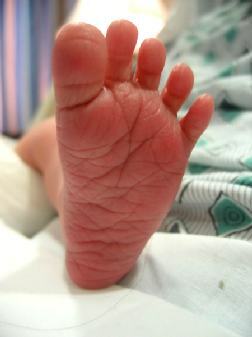 Congratulations….your baby boy is adorable! Welcome to the world little Nathaniel – congratulations Leslie and Allen 🙂 So pleased to hear your little boy is finally here. He is absolutely gorgeous!! Congratulations!! You’re so lucky that your mom is close by for the occasional “nap break”… that’s fantastic! Enjoy the newest addition to your family!! Congratulations. He’s a cute one. I look forward to seeing more pictures of him as he grows. Congratulations on the birth of your baby boy, I am so glad that you are both doing well. He’s a very cute baby! CONGRATULATIONS!!! The love you feel…it’s amazing isn’t it!??! *hugs* Leslie!! Congratulations to both you and Allen!! Nathaniel is beautiful!! Hi Leslie~ I am a new member to the Neighborhood RR and popped over to read your blog. What a wonderful surprise read about a new baby :0) Congratulations, what a beautiful baby boy! I laughed when I read your comment about the 15.8 oz~why don’t they round that???? Having had 2 c-section I “feel your pain” Hope all is going well. I wish you, Allen and Nathaniel a wonderful holiday. Awwwww so cute!!!! Congratulations on your new little sweet pea. He’s adorable and I’m so glad that outside of your little one being a little too comfortable in your womb all went well. Congratulations again from your Leesburg stitching neighbor. Congratulations! What a cutie pie! 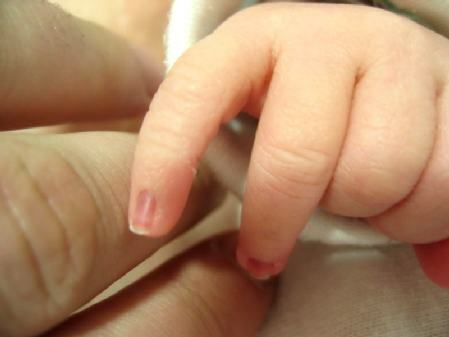 It always amazes me how perfect their little toes and fingers are. What a cute little baby! Congratulations on the arrival of Nathaniel! Congratulations! He looks so cute! Ohhhh, what darling little wrinkly feet! Congratulations on your beautiful new baby! Welcome, Nathaniel! Congratulations to you all – he is absolutely beautiful! Wow! Congratulations! I can’t believe I am so behind on seeing the big news!!! Nathaniel is gorgeous and I’m so glad he is finally here with you! Congratulations! He is precious :). Glad to hear that everyone is doing well! congratulatios!!!!!!!! he is a handsome one!! I apologise for the lateness, I am behind on blog reading.